WoV658 / ELW506 / URW078 The word of God is source and seed (Dufner) "The Word of God is breath and life; It comes to heal and wake and save. So let the Spirit touch and mend and rouse your dry bones from their grave". Lyrics (downloads a pdf). TiS 409 / AHB 322 / CH595 / UMH543 / VU202 / StJ / SLW43 / W&R328 / Cha250 / StF391 / MP488 O Breath of life come sweeping through us (Elizabeth Porter Head) This is a really good older style hymn with inclusive lyrics. Lyrics and sound sample. Not all verses are in all hymnals. Oldy-but-a-goody. *Recorded Music Out of the depths (Sinéad O'Connor) A sensitive and heart-felt version of this Psalm. From the album Theology. Youtube video. Lyrics. Available from iTunes. *SFFS 2136 / NCH554 / GA227 / VU611 / G(II)636 / GC877 / Cha510 Out of the Depths O God we call to you (Duck) A simple and honest hymn, which sings this Psalm from the perspective of a community trying to work out its faith together. Excellent words and the tune is quite straightforward. Lyrics and sheet music sample. Video with lyrics (click on "more info" near the Subscribe button for the lyrics). *AoVK-58 We wait in hope for the Lord (Ford) Simple a cappella round; also good for kids "We wait in hope for the Lord, God is our help and our shield. And so our hearts rejoice, for we trust in God's holy name". Good for kids. G(3)143 With the Lord there is Mercy (Guimont) A simple refrain to a cantor- or reader-lead reading. *Linnea Good Out of the depths I cry (Bauman / Good) Simple refrain. *Online resource Out of the Depths (Harding) A simple four part arrangement which would be nice if you have a choir or quartet that could sing this. Available for purchase, and you can view a sample PDF here. Note that the sound sample is for a different song, so that's a bit confusing, really. NCH472 / UMH474 / VU670 / R297 / ELW875 / HPP434 / GtG834 / PH404 / G(II)637 / GC874 / GC(II)847 / G(3)955 / CP509 / W&R500 / Cha628 Precious Lord take my hand A classic gospel song. TiS 667 / G(II)415 / GC591 How shall I sing to God (Wren) The words are excellent, but neither the tune in TiS or Gather hymnals is straightforward because of the difficult meter; this might be a good song for your musicians to present to start teaching the congregation so they can remember it in more difficult times. All lyrics and sheet music sample of the Gather hymnal melody (HOPE) here. *?PfAS130G For you my God I wait (Tice) A good reflective song, needs to be played quite slowly and meditatively I think. PfAS103B Out of the depths (Harmon) A nice alternative response. "Out of the depths I cry to you O Lord". 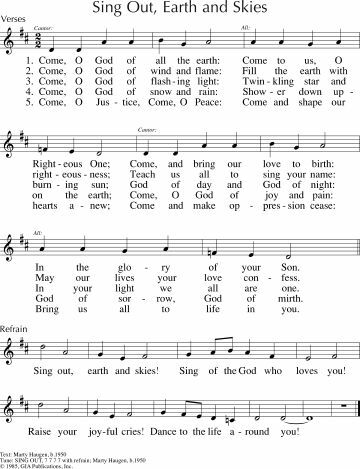 Online Resource Out of the depths (Keesecker) Although arranged for choir, this song is simple and repetitive enough to be used as a meditative song for congregational worship. Sound sample, PDF sample, and purchasing options. Tune In: Spirit of the Father, Spirit of our Mother / Alive in me (Anderson) Catchy boppy pop song about God's spirit within us and within the world. Music sample, sound sample and lyrics. Good for kids. Music sample, sound sample and lyrics. *SFFS 2228 / Online Resource Sacred the Body (Duck) Excellent words - and it's not easy to find good songs for this passage. The tune is new, but very simple and beautiful. It will be picked up very quickly by most congregations. "Sacred the body God has created, temple of Spirit that dwells deep inside. Cherish each person; nurture relation. Treat flesh as holy, that love may abide." 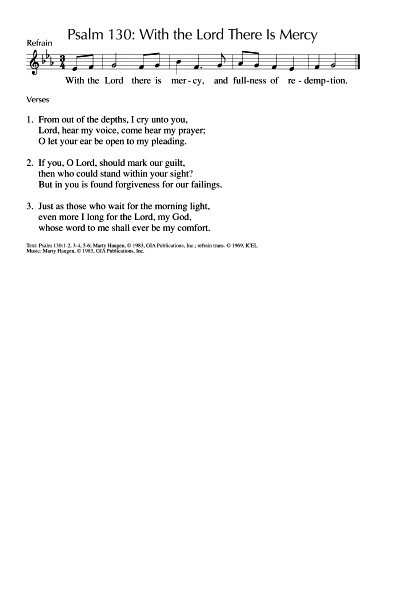 Tune and lyrics from Baylor University Christian Ethics Hymns Library (an excellent resource!). Tune In: See our God with the tear-streaked face / Our God who weeps (Kate Scull) Very simple folk tune and challenging and hopeful lyrics. Sound sample, lyrics and songbook. Recorded Music Lazarus (Malcolm Gordon) A song seeking personal healing of our own Lazarus within. Sound sample and purchase options. NCH192 / VU146 / SFFS 2106 / HPP183 / PH312 / Cha199 / 82Hml-715 When Jesus wept (Billings) I like this simple round. Partly because it's by a Sacred Harp composer - William Billings. It's also very restful and beautiful. I quite like this video sound sample. This might be a good song for the musicians to sing during the offering, or in a prayer of confession. FFS09 Christ of the sad face (Murray/Gibson) Christ weeps for the city, the earth. A longing for peace. Lyrics and an alternative tune. VU471 / W&R692 / URW122 Eat this bread and never hunger (Damon) Very simple tune. The first verse refers to this passage. Particularly good if you are celebrating communion this week, but will be fine if you are not. I will suggest this song again next week and the week after, so this is a good week to introduce it! TiS 210 / AHB 141 / NCH042 / CH352 / UMH57 / VU326 / LBW42 / ELW295 / A&M742 / HPP74 / GtG610 / PH466 / CP306 / CP(E) 534 / W&R96 / Cha005 / Srce506 / 82Hml-493 / StF364 / MP496 O for a thousand tongues to sing (Wesley) A classic. I particularly love NATIVITY for these words, and it's such a fun tune. Be careful with the words "ye dumb". Voices United has "Hear him you deaf, you voiceless ones, your tongues again employ" which is more respectful. Lyrics and one possible tune. Oldy-but-a-goody. *WoV658 / ELW506 / URW078 The word of God is source and seed "The Word of God is source and seed; It comes to die and sprout and grow. So make your dark earth welcome warm; Root deep the grain God bent to sow." Lyrics (downloads a pdf). AoVK-125 / ATW 489 Turn our sadness upside down (Newton) Good for kids, and adults too. Simple tune, but not so simple that it’s boring. Lyrics (search in the page for "sadness"). *Tune In: You in all our worries / All will finish well (Brown) “In this world where injustice reigns, you are in the midst of pain”. Excellent words of reassurance in a difficult world. Sound sample, lyrics and songbook. Recorded Music See How Deep (Malcolm Gordon) This song of devotion is based on the thought of Jesus weeping over Lazarus and the crucifixion. Sound sample and purchse options. What ideas do you have? Please share them in a comment below! Thank you for your site. I am a Director of Music and Worship in suburban Seattle and a fan! I'd add to your Gospel list Joy Patterson's "Lazarus Lay in Death's Dark Shroud" available on the Hope Publishing site with onelicense permissions. We sing it to RYBURN, as the MELITA has a military association in the US as the Navy's "theme song" �� Thank you for your work. It is appreciated! !